We picked five artists from “Mono: An Exhibition of Unique Prints”, Flowers Gallery, and asked them five questions about their own work. Mono: An Exhibition of Unique Prints at Flowers Gallery will feature monoprints by over thirty artists, many of whom work primarily in other media. 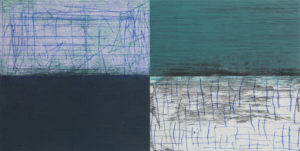 The term monoprint or monotype is applied to prints that are completely unique, of which only a single copy is produced. 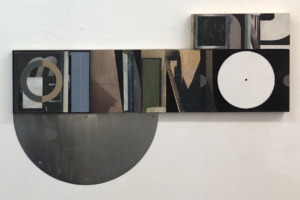 This way of working often allows the artist freedom to explore new ideas and techniques which may then go on to inform their wider practice. Could you explain this work? It is from a series of paintings, prints and drawings in which old women are wandering through the metropolitan “deserts” of supermarkets. To me these superstores are wastelands, obviously not in any literal sense, but because they are “non-places” processing humanity through an impersonal wilderness of aisles. These stores may attempt to expunge anything negative with their sleek surfaces and bright, infantile colours, but such brightness and gloss act as foils to some of the solitary or messy shoppers who go through them, figures such as these dishevelled, discarded and elderly figures. What does this piece deal with? Solitude, poverty, being on the edges of society, yet a tension between hardship and resilience as my figures pursue their way with their shopping trollies, exhibiting fortitude and determination. What medium and techniques did you use? Monoprinting, using oil paint painted on a zinc sheet, printed on Somerset satin paper. What were the struggles of making it? Drawing from life in supermarkets was challenging since I had to pretend not to be looking at my subjects. And taking photos was forbidden. Then working from drawings and turning them into new pieces of work (prints in this case) without copying the original was also a challenge. Such “copying” would have made the piece look second-hand and lifeless. Monoprinting is, however, always surprising and, to some extent, out of one’s control. You do not know what marks and tones are going to be reproduced until you peel the paper from the plate and so you cannot slavishly copy another piece of work. What is the purpose behind this work? To create a memorable, succinct image that economically sums up a human presence and a state of being. I made two sets of monotypes in the late 1990’s at the Garner Tullis Workshop in Santa Barbara CA. 1997 was the year of my first ever mono project and I worked with Garner’s son Richard Tullis, who also studied paper making in Japan. Richard made beautiful sheets of thick white pulp paper a centimetre thick which I worked on: the paper was an object, not just a sheet of paper. The print I am writing about here is called CRRT 97 20A – Santa Barbara Series. The title has the prefix CRRT which stands for both my initials and Richard’s: then the year it was made, 1997, then a number 20 which indicates the sequence in which the prints were made and finally A which indicates it is with the artist. The set of prints were divided between the printer and myself. This mono is a simple blue grey ring with an opening at the top, one end straight, the other curved. The opening is like an entrance or exit, to or from an enclosed circular space. I find the mono print process very direct and physical. I worked fast and instinctively, painting with oil paint directly on to an aluminium plate. It’s a primary process entirely dependent on painting, before transfer onto paper. Having access to a hydraulic press, extraordinary hand made paper and also given space to work in a vast open warehouse next to the ocean were key elements that brought the monotypes into being. I chose to use the hydraulic press but there was also a giant rolling press that I didn’t use, modified from a previous incarnation, pressing aircraft wings. 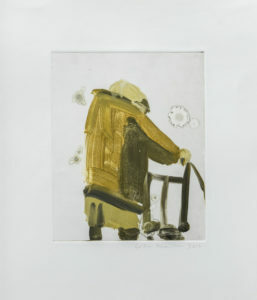 Sam Francis, Richard Diebenkorn, Sean Scully, Catherine Lee, John Walker, Christopher le Brun, Ken Kiff were among the inspirational artists who worked at the Garner Tullis workshop, all making monotypes. My husband Trevor Sutton and I were introduced to Garner Tullis by Sean Scully. I worked with a mixture of oil paint and a resin medium directly onto aluminium plates. The paper was then put under a hydraulic press, laid over the prepared plate and slowly pressed down at 800 tons of pressure into the paper, substantially flattening it in the process. The prints were always referred to as monotypes at the Tullis workshop because of the emphasis on painting rather than printing, and the fact oil paint was used and never printing ink. It truly wasn’t a struggle at all making this print…more of a joy to work in such a beautiful spacious west coast studio just trying things out in a very intuitive way. If i made something I didn’t like I just tore it up and started another. In the late 1990’s I was making particular reference to archeological/architectural detail that I’d come across in Rome on a residency a few years before. I had been looking particularly at Classical Roman archeological sites. 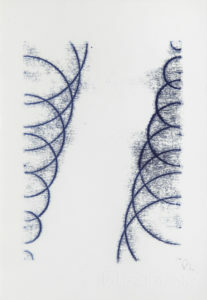 Many of the monotypes have a planform feel, as if viewed from above. This one with its open circle has a strong architectural reference. This is a 2-part hand coloured etching that was made in 2002. The drawing was started in Ireland at the Ballinglen Arts Foundation in Co Mayo and printed and hand coloured in London. It’s an informal response to being on the Atlantic north west coast of Ireland, a place utterly different from my normal work place in London. Co Mayo has a wild and beautiful rural coastline with constantly changing weather and spectacular atmospheric light. A place I love. Drawing came first, on to a copper plate, then the etching and printing process. Finally, the hand painting was added to collaged printed sections. I don’t see that any struggle was involved …it was a harmonious and creative process from start to finish. To maintain my relationship with myself. 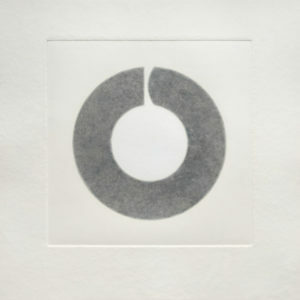 ‘Arc I’ is part of series of ‘Arc’ prints which are the most literal translation of a monoprint. They are a sequence of arcs that are explored in different sizes and combinations across the body of work. Each piece is unique, if I repeated the exact same image, the result would be different due to the printing method. I am investigating how to capture the simplest gestures of drawing with monoprinting as a method to highlight the process of mark making. I’m interested both the qualities of line created by the increase in size but also it’s relationship to the drawing tool. The traces of the artist’s hand can be seen, on the surface of the paper and tell-tale details, such as the pin prick of the compasses point. Many of my prints are made in sets that explore of growing intervals of circles with warming or cooling tones of colour. They are created by placing paper on an inked up surface, and drawing onto the back of the paper. The paper is prepared with a grid of marked out points that guide me where to locate the compass. At each point, I change the diameter of the circle in accordance to my system. Each print has a different order in place – that allows the circles to increase in size. As they grow the curves stretch out, flatten and begin to interlock. 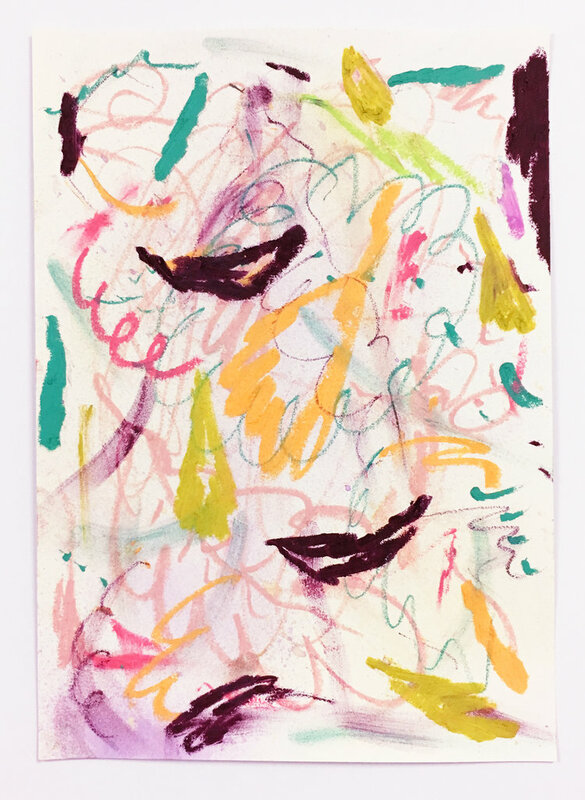 The challenge with these prints is to create to delicate marks that leave soft traces on the surface of the paper. I spent a reasonable amount of time testing different paper types to find the desired texture. In my studio practice I often create large scale wall drawings and installations; my works on paper allow me to explore the artistic process further. My prints are a means to test out ideas, finding new drawing techniques, spatial possibilities; but also are artworks in their own rights. I often work with techniques that have rules or restrictions to indicate the relationship between the artists’ touch and the mechanical printing method. Basement II is part of Flash Mob, a series of portraits – figures, faces, postures, gestures. The monotypes show glimpses of friends of mine from snap-shots taken in-the-moment; sometimes blurry, over exposed, ad-hoc photos captured on celluloid film. As a collection of prints, they are made to sit together on mass, as a congregation or gathering. 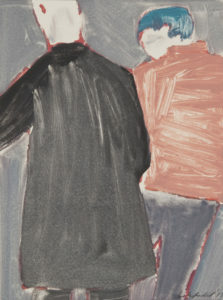 These works were about selecting moments, fragments of time, memories and preserving them. The photographs are frozen documents which I wanted to re-animate. Through a process of documenting and digitally manipulating the images, I transformed the physical prints into a series of moving-image pieces which embodied time – slowly morphing. This process of mono print is direct and immediate like painting. I apply oil paint, rich pigmented etching inks, extender, grease and thinners in various consistencies onto a metal plate using a variety of brushes. The ink is malleable. I can move the image around or rub it away with a rag, use coarse bristles leaving scratchy marks or a fine hake to soften and blur the tones. The plate is then passed through an intaglio press with a damp heavy-weight paper which absorbs the ink deep into the paper pulp – so a flush mirror image is created. I love the surprise of seeing the work for the first time, in reverse. Translucent areas within the ink have an luminescence to them, where the paper glows through the image, which is what gives monotypes a certain ability to depict light. After printing there is an inky residue left on the plate which I often use as the starting point for the next piece. So there is a sequential pattern to producing the work, the left overs of one image informing the next. I seek to make work that does not just replicate the source photos but are images within their own right. For this series I used the photographs as a jumping off point, to re arrange, re-compose, simplify and have a free reign to select un prescribed and disingenuous colours. Its about deciding whats the most important thing in the image, and what would be better left out- and this is usually the make or break of the print. Usually I work quickly and intuitively, creating a body of work, so sometime the struggle and satisfaction comes in editing, selecting and discarding work. To re-visit a collection of photos which weren’t intended for printing, to re-live and rework them in the studio – from photograph, to print, to moving-image.